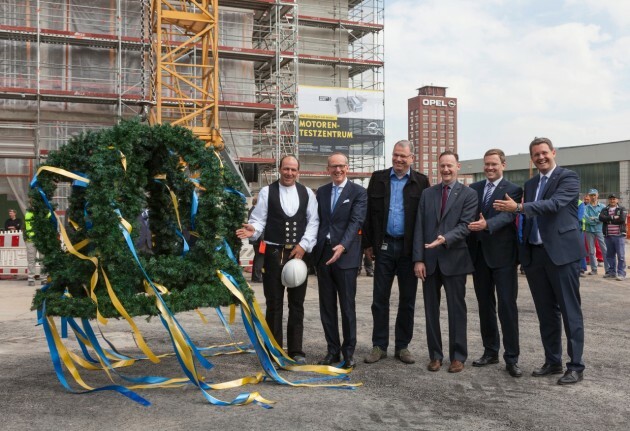 Opel Group CEO Dr. Karl-Thomas Neumann and Head of Works Council Dr. Wolfgang Schäfer-Klug attended a topping-out ceremony that took place at the site of a new powertrain center in Rüsselsheim, Germany, on Thursday. The plant is expected to be inaugurated in 2017. Also in attendance were Dan Nicholson, GM’s Vice President, Global Powertrain, and Rüsselsheim’s lord mayor Patrick Burghardt. The groundbreaking ceremony took place at the construction site last summer, and an impressive 180,000 accident-free work-hours have taken place in the time since. The powertrain plant represents the largest building investment in Rüsselsheim since the opening of another GM production plant in 2002. The new plant is said to encompass 36,000 square meters, and it will host as many as 43 latest-gen performance test benches.